Consumers, in 2017, expect companies to engage with them across social channels. But for many ecommerce businesses, social media management is often overlooked or relegated behind other tasks. In this article, I’ll address three common mistakes that businesses make with social media marketing. Deciding early on the goals of your social media presence will likely shape your strategy. Are you planning on increasing brand awareness, site traffic, and leads? Or are you looking to use social media as an additional customer support channel? For some businesses, it may be a combination of these, especially as their audience grows. Once you determine your strategy, identify platforms to use. If your company is focused on lifestyle or fashion, consider Instagram and Pinterest. 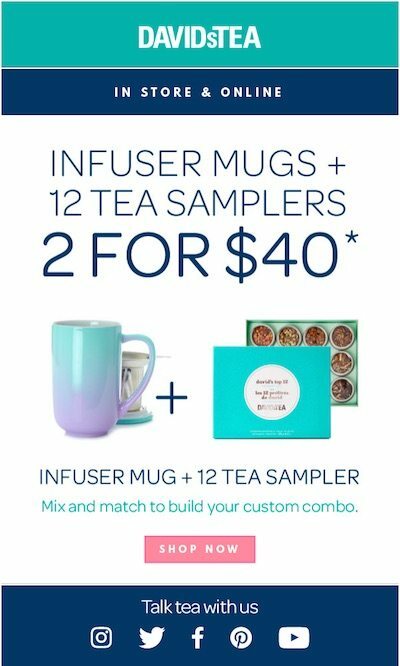 Both frequently roll out new options to increase sales. Take, for example, Pinterest’s “Shop the Look.” When a Pinterest user clicks the blue dots in an image, a page loads with the exact items in that image, allowing the user to purchase those items. Pinterest’s Shop the Look allows retailers to build ad units that allow users to click and buy from the Pinterest feed. For retailers that sell items for crafts, hobbies, and do-it-yourself projects, sharing videos and tutorials on YouTube and Facebook would likely work well. This instructional video from Fire Mountain Gems explains how to use its bead products. For reputation management, it may make initial sense to set up profiles on the major platforms to secure your brand’s name. But don’t feel overwhelmed in thinking you need content for each channel. Try out a two or three of them to see where your audience is engaged and focus from there. Beyond that, think about how to promote your social media channels. Placements in email are common. DavidsTea promotes its social channel on email, encouraging recipients to “Talk tea” with the company. Adding social media links with proper Schema markup can help Google connect your site and social media profiles. 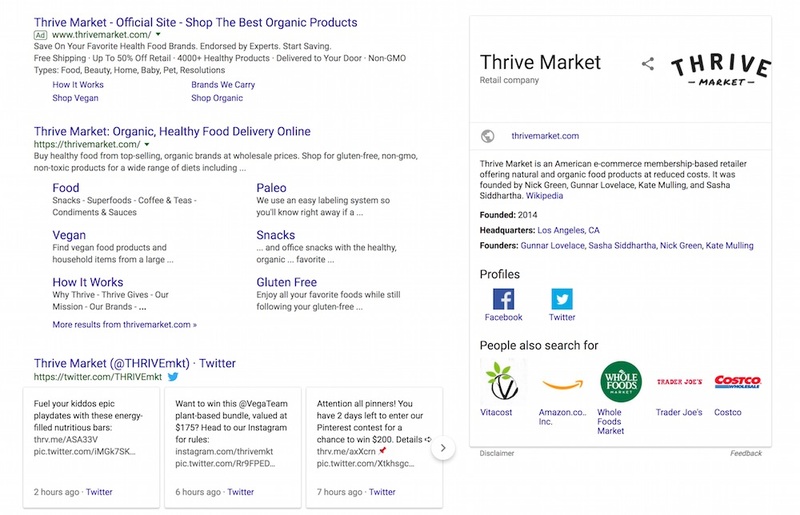 This can help establish a knowledge graph, as seen in this example from Thrive Market. Additional vehicles to promote your social media profiles include shipping boxes, package inserts, and employee email signatures. What to post in your social profiles depends on your organization and its social strategy. For most of the popular channels, the days of posting your own content and hoping for traffic to roll in are long gone. Twitter and Instagram moved away from a chronological feed to one that prioritizes the content of each user. Facebook was the first to change users’ timelines, to emphasize “pay to play.” Thus promoting and boosting posts on Facebook or setting up Facebook Ads are for many brands a harsh reality to gain exposure in consumers’ feeds. Analytics, whether native to the platform or through third-party tools, such as Simply Measured and site analytics (i.e., Google Analytics), can help determine which content most resonates with your audience to layer on advertising dollars for additional reach. Customers and prospects are going to talk about your company whether you are listening or not. So taking a proactive approach can prevent a small mishap from turning into a much larger public-relations issue. There are many social media monitoring tools to get one started, including Hootsuite, Social Mention, and Mention. While the free versions of these tools may be limited, paid versions include content scheduling, analytics, and reporting features, to increase your understanding of what is working well and what isn’t. But listening tools can only do so much. Being responsive when consumers post on your profile is important, especially to the users that post. 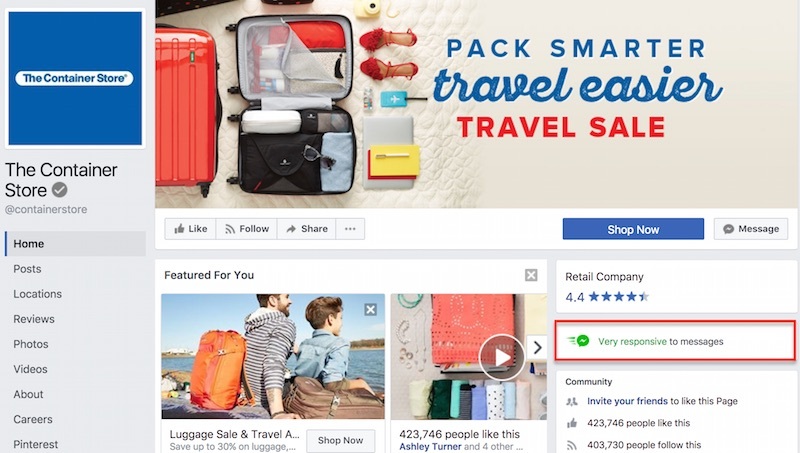 Facebook thinks so, too, which is why it offers businesses a way to earn the “Very responsive to messages” badge, letting visitors know they can anticipate quick responses. As an aside, Simply Measured offers a Facebook Customer Service report to help monitor this data if customer service responsiveness is part of your social media strategy. The Container Store’s Facebook Page displays the “Very Responsive” badge (on the right). Product and service problems are bound to occur for most companies. Using social media channels to communicate those problems can keep customers informed. This happened a few years ago with Weight Watchers, when its mobile apps did not work due to a site-wide overall. 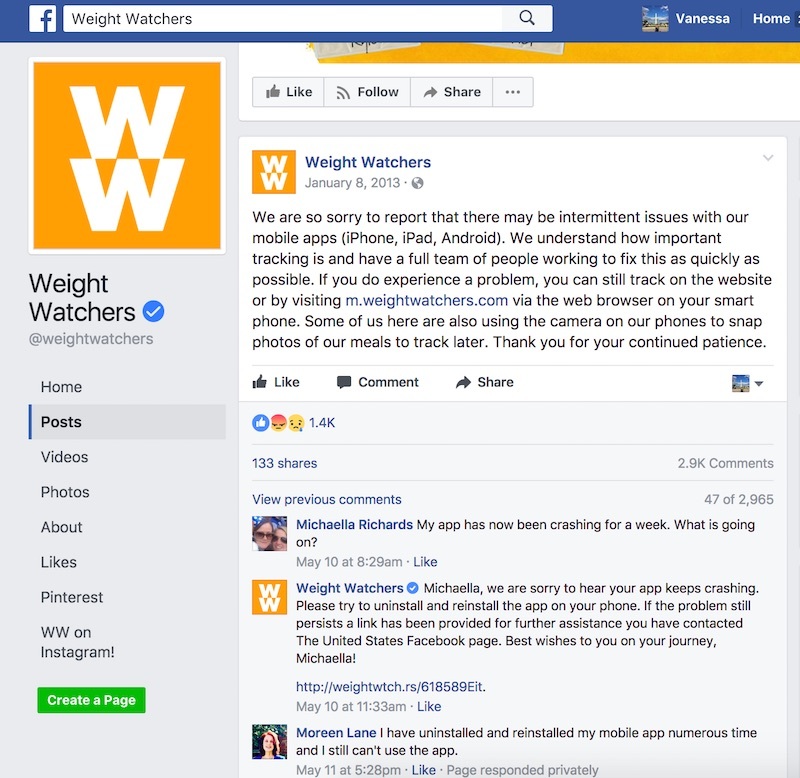 Weight Watchers used its Facebook page several years ago to communicate problems with its mobile apps. Knowing how and when to respond to a crisis will be unique to your business. Having a documented plan in place, including sample responses and escalation steps, can help. Experimenting with emails, digital campaigns, and site changes is common. Apply the same mindset to social media. As an example, live video may have seemed unimportant 18 months ago. However, many organizations now use live video to engage their audience. Think of ways to experiment with live video for your business. Could you interview experts, or showcase new products or partnerships? 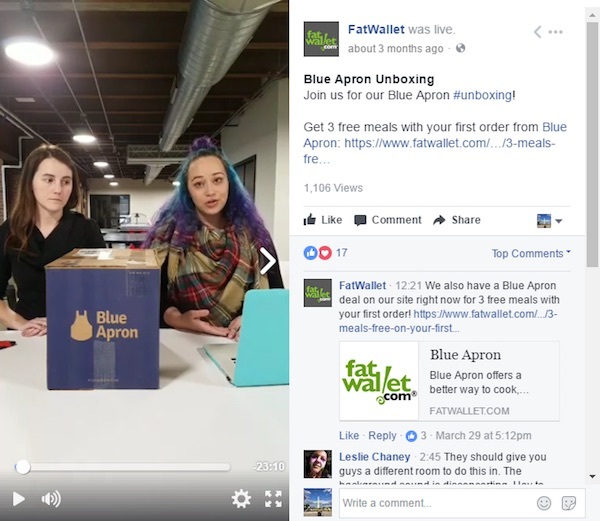 For example, meal delivery service Blue Apron teamed up with FatWallet, a discounts and coupons site, to live-stream on Facebook an unboxing of Blue Apron products. Live video on Facebook is more prominent in users’ feeds, providing an organic (not paid) opportunity for brands. Blue Apron opened the contents of a product box and live streamed it all on Facebook, helping its audience understand what it sells.